Fertilising vegetables is not like baking a cake, where we get a consistent result as long as we follow the recipe. With vegetables, we have to deal with different soils and take into account the elements already in the soil. Too much nitrogen too late can cause long, thick necks on the plants. 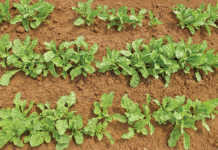 Most vegetables thrive in soil that has adequate amounts of nutrients in the correct proportions, as discussed in a previous column. But the higher the organic content of the soil, the less important these proportions become, making crop production far easier. This leaves us with nitrogen (N), which is used to boost the growth of crops and is one of the most important factors in determining the success of a crop. Base your initial fertilisation on a soil analysis and what is likely to be extracted by the crop; this approach will maintain soil fertility at the desired level. The amount of fertiliser will almost certainly vary from land to land. Many publications still advocate specific pre- and post-planting fertilisation based on the nature of the crop, irrespective of what is already in the soil. This can cause an imbalance of nutrients and waste money. READ What’s in a handful of soil? Once you have correctly fertilised the lands before planting, stimulate growth with N to bulk up plant volume. In an onion, the swelling of the lower parts of the leaves produces the bulb, and there is a correlation between leaf size and bulb size. A small plant cannot produce a large bulb, so you need to bulk up as fast as possible before the day-length signals the plant to start bulb formation. After this, reduce the N according to leaf colour, which should change from lush dark green to medium green. 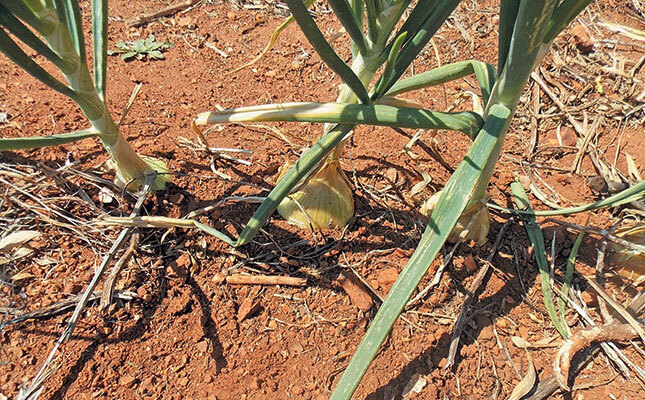 This tells the plant that conditions are becoming less favourable and it must therefore concentrate on developing the bulb, storing reserves to survive a dry season. If too much N is available when bulb formation is initiated, the plant may short-circuit bulb development and go to seed. This is associated with thick necks that delay maturity and form poor bulbs. 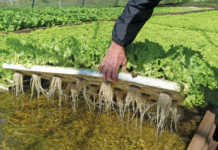 The characteristics of the variety, climatic conditions and plant population also play a role. For example, you may get away with overdoing N with one variety but not with another. 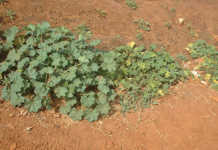 Too much N can also make the plants more vulnerable to leaf diseases. Pay attention to the leaf colour of the crop throughout – fine tuning can make a significant difference to the end-result. The amount of N to apply will vary from year to year due to leaching, so don’t base this year’s figures on last year’s N requirements. They are simply a guide. Learn to ‘read’ the colour of the leaves instead. Onions are sensitive to a lack of zinc (Zn). As Zn is no longer routinely added to fertiliser mixtures, you will need to determine the Zn status of the soil. A deficiency will show up as leaves curling at the tips like pigs’ tails.